The Byron Tigers came up short in their bid to win a second state championship, which would have been their second since in school history. Byron had been the No. 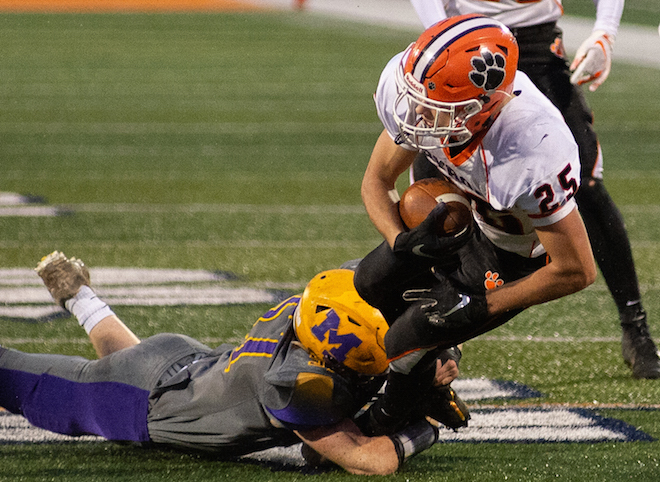 1-ranked team in 3A since the preseason and they were looking an awful lot like the team from 1999 that won it all, but one too many mistakes put them on the short end of the score, 24-20, against Monticello on Friday, Nov. 23 at Memorial Stadium in Champaign. The Tigers had their chances during the game to pull out a victory, but things just didn’t go their way. Midway through the third quarter they were stopped on fourth-and-an-inch, and then in the fourth quarter with just under four minutes to play Monticello picked off a pass on a lucky bounce that killed a Tiger drive. To read the full story and see additional photos from the championship game see the Nov. 29 edition of the Tempo.